Welcome to this month’s Blogorail Yellow Loop. 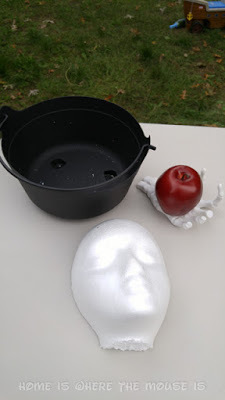 Today we are sharing Halloween craft ideas. I love decorating the outside of my house for Halloween. It’s a great way to set the mood for trick-or-treaters, and it’s also another chance for me to show my #DisneySide! Half of my front lawn becomes a spooky graveyard for the month of October. 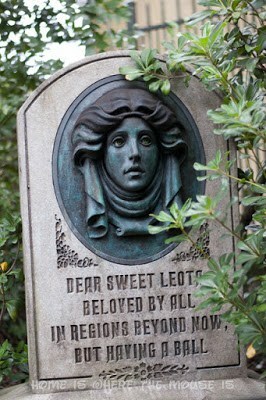 Many of the tombstones that make up my haunt are Disney-inspired. 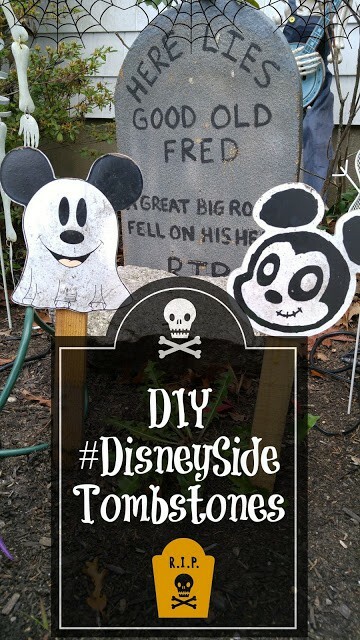 Here’s how you can show your #DisneySide with tombstones this Halloween. 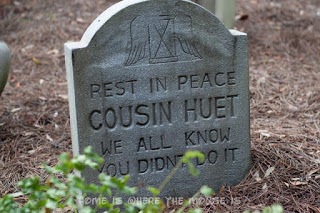 So just how do you show your #DisneySide on a tombstone? 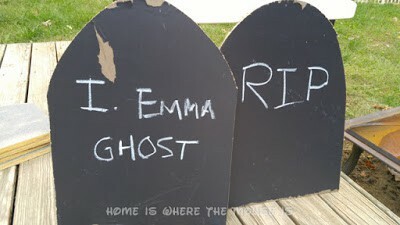 One easy way is to imitate actual Disney tombstones. 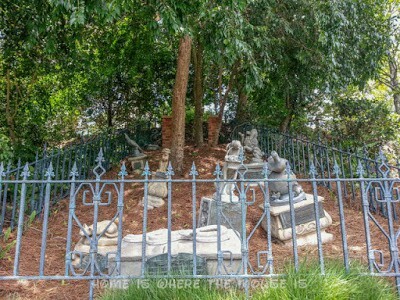 The most famous Disney tombstones reside in the queue area for the Haunted Mansion. One of my favorite attractions, I had memorized them all as a kid. Little did I know that they were all tributes to actual people who contributed to the attraction! 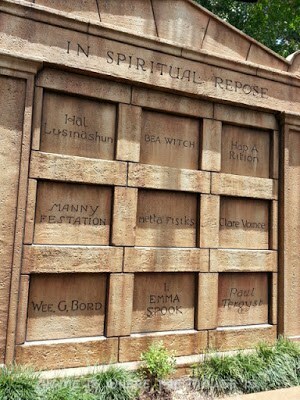 In addition to these famous tombstones, there is an entire graveyard scene within the attraction, as well as many humorous markers to be found as you exit. 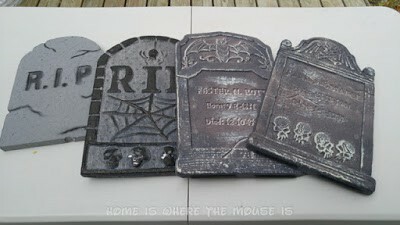 I have several tombstones in my display that are copied directly from the Haunted Mansion cemetery. 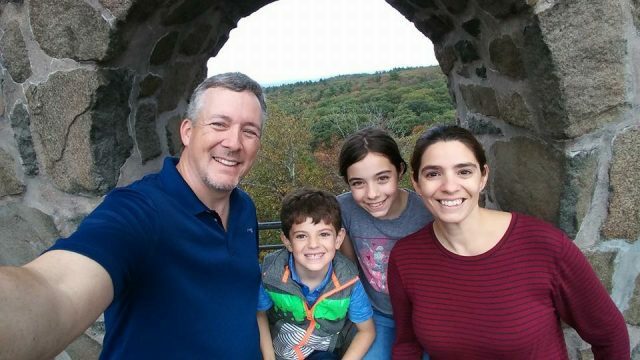 If you want to be original, you can certainly come up with your own using people in your own life.It would probably be a bit morbid to just slap their full names on a tombstone in your yard, but using just a first name or variation with a clever or funny phrase could be a lot of fun. Another source for inspiration for your Halloween display could be Tim Burton’s Nightmare Before Christmas. Jack Skellington, Sally, and Zero would make wonderful additions to any display. The tombstones inspired by this movie could be copies of ones from the film or they can just borrow the style from the animated hit. 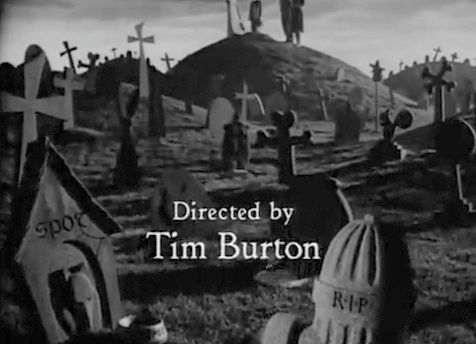 For more inspiration, check out the pet cemetery in Frankenweenie. I am already envisioning a Halloween display that can be used for Christmas too! Killing Mickey Mouse is certainly a twisted thought, but there are plenty of dead Disney characters to choose from. 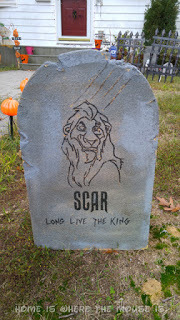 For my graveyard, I’ve been working on a Disney Villains section. My first few attempts have been made of plywood. It’s a lot of fun to come up with clever designs and sayings to use. I think the for the next few I will try to add more details to give the tombstones some character. Another idea, if you want to be a little more twisted… Disney is notorious for killing off parents of its main characters. There are many ways to make a tombstone decoration. Some are super simple, and others require a little more material, tools and skill. You can find cheap styrofoam tombstones everywhere in the weeks leading up to Halloween. They range from basic “RIP” stones to more intricate designs, but they’ll all have completely blank backs! Just turn over the tombstone and use the back as a blank canvas. All you’ll need is a magic marker or a paint marker for this. 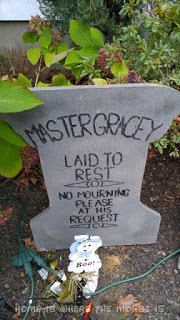 If the tombstone is darker gray or even black, you’ll want to use a white paint marker. 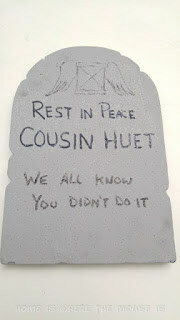 I quickly copied the epitaph and design for a Haunted Mansion stone on to the back of one from the Dollar Store. If I took a little more time to plan out the spacing of the lettering, it might have come out better. Dollar store tombstones are usually on the smaller side. If you are willing to spend a few more dollars on each, you can buy larger ones on sale at discount stores or party stores. 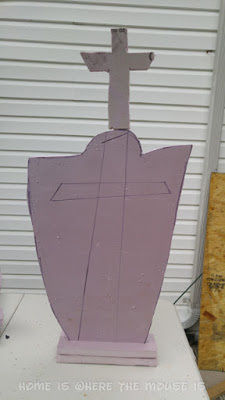 Another simple way to make a tombstone is to cut the shape out of cardboard or foam board. Cardboard is probably readily available around the house, and foam board can be bought pretty cheaply as well. I bought some white sheets of Foamboard at the Dollar Store. 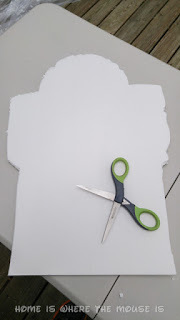 This lets you design your own shape to your tombstone and cut it out with scissors or a razor blade/exacto knife. 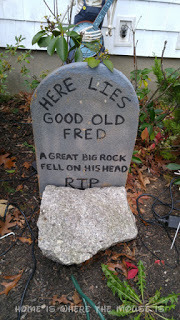 I had an old styrofoam tombstone that broke. 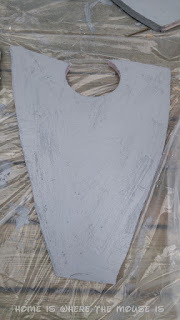 I traced the shape on to my foamboard. For a thicker tombstone, layer multiple sheets together. You’ll also need some paint. 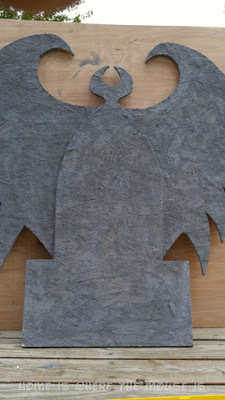 Spray paint works well and can even comes in a gray stone texture for a more realistic look. You can also use a can of paint if you are doing a lot of tombstones. You can try adding sand to the paint for texture. 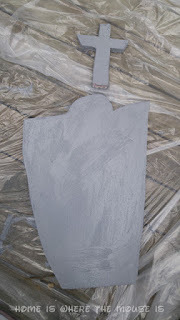 I have a can of gray paint to use as a base, and I then make pass using the textured spray paint to add a little detail. 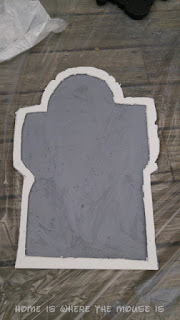 For this tombstone, I traced the shape of an old store-bought tombstone that had broken. I used two pieces of foamboard. I cut out the middle of the second shape as well, to create a raised border for a 3 dimensional look. It’s easy to make, but still very light. One good windstorm could rip this apart. 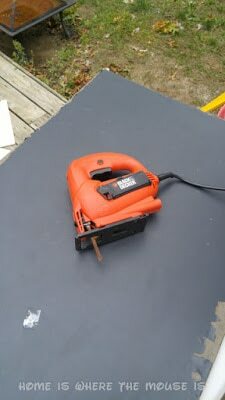 I might considered attaching this to a wood backing to make it more sturdy. An interesting alternative to paint and markers is to use chalkboard. Our local Home Depot sells Chalkboard in 2’x4′ sheets. I had one at the house that the kids had used for drawing on outside. Some of the chalkboard layer was flaking off from weathering, so I figured I would cut it up. 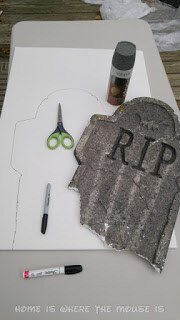 Using a jig saw, they can be cut into tombstones and then written on using chalk. The kids can have fun changing the names and making up new ones. There’s no painting involved with this one, they are sturdier than cheap styrofoam, and there is something about the chalk that seems to work for me… these would be great for old west style tombstones. I drew some quick shapes based on the style of Nightmare Before Christmas. 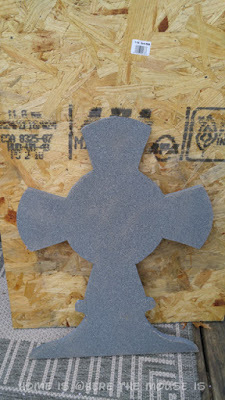 One of the fun things about the this foam insulation board is that you can easily create 3D shapes. They can be painted, just like cardboard or wood. You’ll want to avoid spray paint, though. 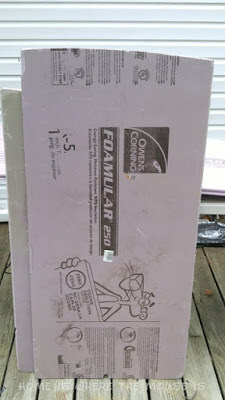 I find that many people who make their own tombstones prefer to use this foam insulation board, and I can see why. It’s very easy to shape and doesn’t weight a lot. These tombstones will need to be secured so the wind doesn’t blow them away. The design benefits make it worth it, though. Wood comes in various types and sizes. It’s heavier and more sturdy than anything else, which makes it good for basic flat shapes. When I started losing styrofoam tombstones to storms, I immediately jumped to making them from wood. Most of the custom designs I’ve made so far have been out of cheap plywood from Home Depot. One sheet allows for a batch of 4-6 of tombstones. I’ve yet to try to make anything three dimensional with wood, but I have some ideas. This tombstone above is my most ambitious attempt to date and will be another Villain. Can you guess which? One of the reasons I love Disney is the little details they put into everything they do. In my graveyard, I’m trying to emulate that. 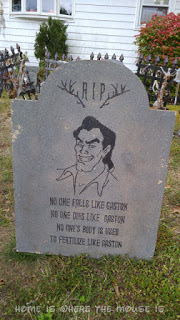 From the fun sayings to the detailed pictures and little touches like the antlers on my Gaston tombstone or the scratches on Scar’s, each detail gives the tombstone character. As I keep making these, I find myself getting more and more creative. Here are some of the details I’ll be adding to my newest tombstone project. Can you guess who’s grave this will be? I hope you enjoyed seeing how I show my #DisneySide through my Halloween decor. Have fun making your own, and be sure to share your pictures with us!! We’d love to see them! Wow! We don't usually do much for Halloween, but I would love to stop by your house for trick or treating. I love that you've given lots of different ideas for putting the tombstones together. They all look great! Thank you. I love making our house an attraction for Halloween. I feel guilty for leaving to go trick-or-treating with my kids. Part of me wants to be at home to see the other kids in the neighborhood enjoying our decorations! Looks like you've really perfected quite a few of these techniques! My dad made tombstones, a la the Haunted Mansion for our house out of styrofoam and silver spray paint and they have stood the test of time! Add a little dry ice fog and it's spooky! I wouldn't say perfected. I'm still learning and getting better. One of the things that forced me to learn new techniques was the weather we get in October. The wind really does a number on the styrofoam tombstones. Thanks for going through and giving your thoughts on all the different materials you can use!! That makes it sooo much easier to get started. I think I like the wood and the insulation materials the best. Could really make some stellar tombstones with those. I think I may have to add poor Mr Toad to mine. Nice tombstones! I'd just like to add for anyone following these instructions that you can't spray insulation foam or foam core with spray paint without first priming it with something like latex or acrylic paint. Otherwise, the paint dissolves the foam! Not only does this release noxious fumes, you'll also lose all the hard work that went into making the stone in the first place! That's a great tip!! Thanks for sharing that! This would be perfect for our front garden during Halloween. Any thoughts on how to add some texture? Thinking dollar store is the way to go but the ones at Disney have all that added depth and texture it would be great to add some of that before putting on the words. That’s a good point. Texture and little details have a big impact. One initial thought I had was to somehow combine two dollar store tombstones, using the texture and details of one with a hole cut out to reveal the words on the other. This would create a thicker tombstone as well. 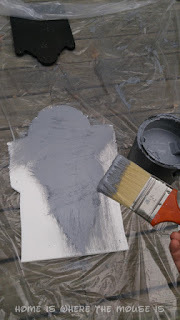 If using the back and intending to paint over the tombstone, you can add details and accents before painting. Raised foam stickers for the lettering, scrapbooking supplies, or perhaps drawing your own design using a glue or even a caulk that will harden and allow you to paint over it. Drywall or wood filler? 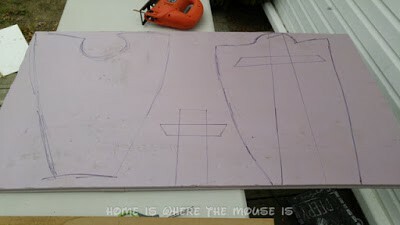 That could create a surface you could etch into as well as fill holes and cracks and cover up unwanted designs. Lots of ideas. I’m going to need to test some of these and post about it. Thanks for the question!! My brain is working on it!